Black bear attacks on the rise? Do all of your trailer lights work? If so, consider it a minor miracle. Spring is a time of budding flowers, singing birds, and… busted trailers. 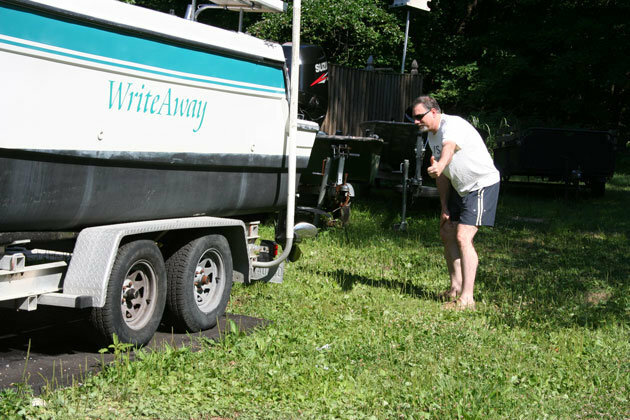 That boat trailer may have been sitting for months on end, and the list of problems that could crop up the next time you hit the road is practically endless. Nine times out of 10, however, your spring trailer snafus will be limited to one of these three items. Ready to give your trailer its spring inspection? #1. Lights – First off, do a complete check of all your trailer lights. We all know how common it is for these to fail, and after sitting around gathering corrosion for days on end, you have to expect that one or more connections, grounds, or bulbs have gone bad. If all of them work, count your blessings! #2. Tires – Dry rot could be a problem, so inspect the sidewalls. Also check tire pressure. If the trailer has been sitting with the boat’s weight on it for a long time, there’s a good chance the pressure will be off. And don’t forget to check the pressure on your spare – it won’t do you much good if you get a flat, then discover the spare’s already flat, too. #3. Bearings – If you have oil-filled bearings, hopefully you moved the trailer every few weeks to keep them bathed in oil and prevent corrosion from forming. (That’s always a good idea, regardless of the time of year, and should be standard practice). Inspect the view port to make sure there’s still plenty of oil inside, too. If you have traditional bearings, pull the caps and give them a visual inspection. If the grease is waterlogged, replace it. And in any case, give the bearings a shot or two of fresh stuff. A few other items you may want to check out include the hitch, winch, leaf springs, bunks and/or rollers, and the safety chains. Chances are that something or other will need attention, and now’s the time to take care of it – before it interferes with your fishing-time.